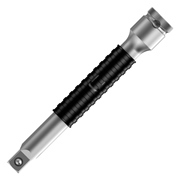 WERA 073252 8796 SC SB Zyklop “Flexible-lock” Extension with Freewheel Sleeve 1/2" 125mm. Flexible lock system for permanent interlocking or fast changes of accessories, with freewheel sleeve for ultra fast tightening or loosening of fasteners. Chrome vanadium, brushed chromium plated finish.